Wright’s philosophy was to design buildings that worked well for their intended use as well as in harmony with nature. This style, now known as organic architecture, is perhaps best represented with Falllingwater, designed in 1935, and considered by many to be his masterpiece. Wright was known as a pioneer in the Prairie School style of architecture. In addition to homes, he designed many commercial buildings, such as churches, offices, hotels, and museums. His interest in interior design led him to design many of the interior pieces for his works, such as furniture and stained glass. Designs modeled after these pieces make excellent home and gift choices for those interested in Wright. 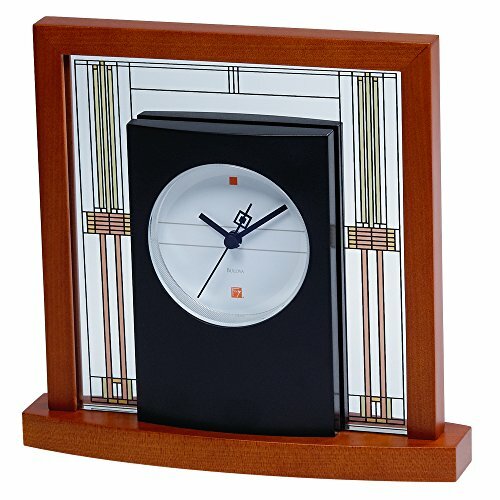 This 14 inch wall clock brings to life Frank Lloyd Wright’s brilliant eye for design. The clock is reminiscent of Lloyd’s design for the Luxfer Prism Company’s building in Buffalo, New York. This clock replicates two of the unique designs used on the Luxfer building. The casing is made up of finished bronze rods. The clock’s face is ivory. This well made piece is a nice way to showcase interest in Wright’s design while also adding a practical feature to the room. Whether the piece is for yourself or as a gift, everyone will notice the attention to detail given to the design. In addition, you can be confident that the clock will stand the test of time due to the quality Bulova manufacturing. This clock is not for everyone. The glass and brass composition mean that every smudge and trace of dust will be visible. Cleanup will be easier however, if it located out of an area where it receives a great deal of traffic, protecting it from dust and curious fingers, while placing it somewhere where you can easily wipe it down quickly. If a table clock is more appealing to you, consider the Willits Table Clock. This clock is designed to mimic the art glass windows of the Ward W. Willits house in Highland Park, Illinois. This mantel clock has a solid wood base and frame, and is finished with a light cherry stain to complete the Lloyd look. 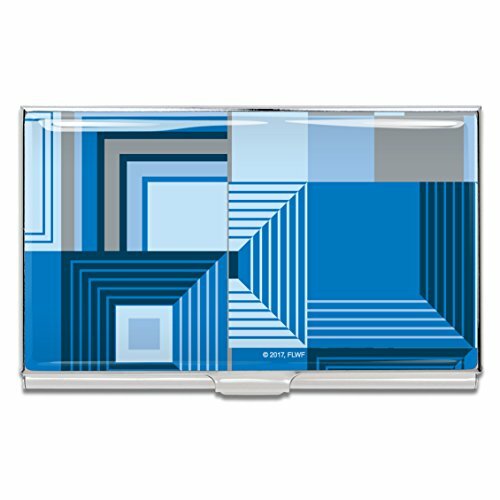 The mineral glass panel adds a contemporary look that will look great in any home or office space. 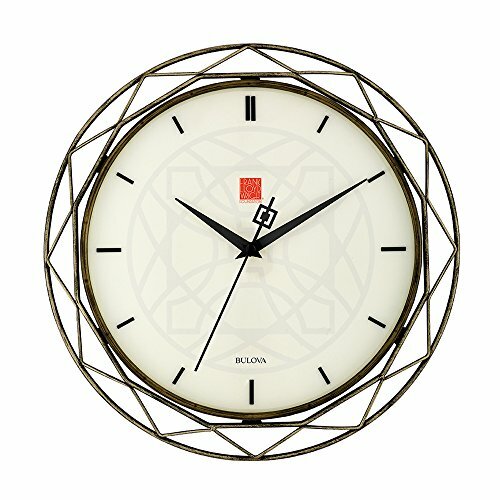 Like the Luxfer Prism Wall Clock, the Willits Table Clock is manufactured by Bulova. Bulova’s partnership with items designed in Wright’s style is a natural fit, as both considered attention to detail and quality to be hallmark traits. One would expect these clocks to withstand years of use. This gift set of four coaster stones are inspired by Lloyd’s art glass designs. Each coaster is 4 inches square, and backed with cork. The coaster stones are made of porous sandstone to absorb sweating and spills. The design, with the porous sandstone on top, and protective cork on the bottom, shows the attention to detail that mimic Wright’s own. The design is distinctive Wright’s as well, making these coasters an economical yet attention grabbing accent. These coaster stones make a terrific accent piece on their own or as an addition to other Wright design pieces. If you know someone interest in Wright’s work, these make a great housewarming or shower gift. The Biltmore Blue design is modeled off of Lloyd’s distinctive design work. This case is inspired by Wright’s work on the Biltmore Hotel in Phoenix. His design of this Arizona hotel fused his Art Deco style with Southwestern influences. The combination is showcased beautifully in this card case. The case holds approximately 12 cards, and comes with a black sleeve. 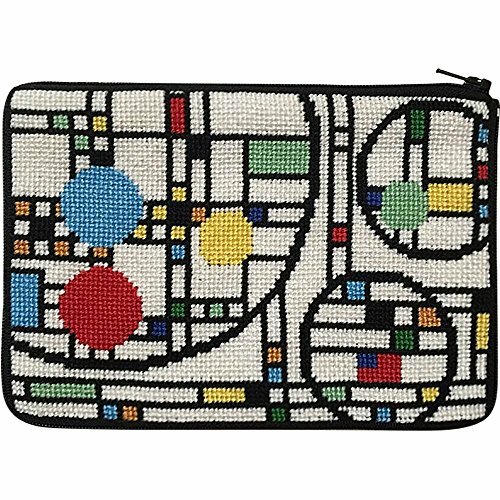 Showcase your love of Frank Lloyd Wright’s design on the go with a business card case inspired by his work. These cases also make the perfect gift for the Wright-lover in your life. The design and color combination make the inspiration for this useful item instantly recognizable. This 20 by 20 inch throw pillow cover is 100 percent cotton and mimics Wright’s distinctive waterlilies design. These covers are well made and easy to keep looking good, as you can safely machine wash in cold water and dry. 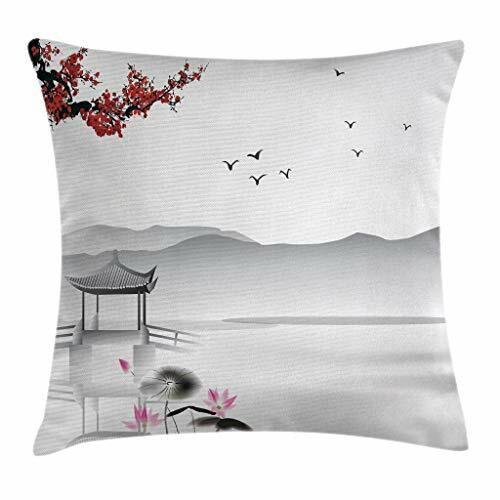 This pillow cover is a good choice if you want to bring some of Wright’s distinctive style into your home in the form of soft goods. 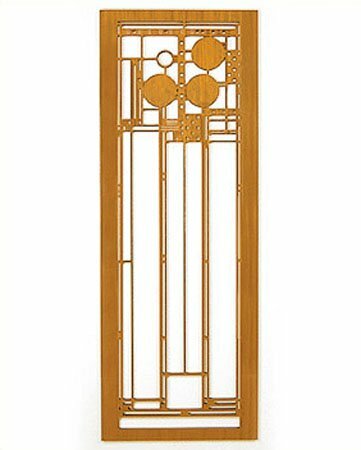 Many of the design pieces inspired by Wright’s work are in the form of clocks, lighting, and wall art. Using pillows to soften the look can create a more modern aesthetic. It is important to note that this is the cover only, it does not include the pillow insert. In addition to the Waterlilies design, you can also choose from March Balloons, Oak Park, and Saguaro. 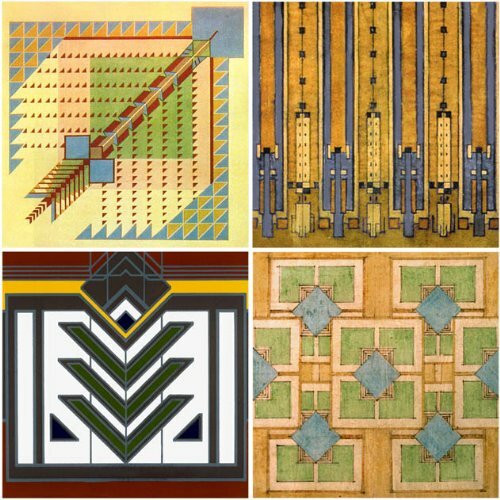 Each of these pillow covers are unique, but also distinctly inspired by Wright’s work. A portion of the sale of these pillow covers support programs of the Frank Lloyd Wright Foundation. This durable fiber and rubber mat measure 22 by 36 inches. It makes a great choice for those who love Wright’s design aesthetic but are looking for practical choices in home decor. The Coonley Playhouse is one of several buildings that make up the Coonley Estate on the banks of the Des Plaines River. This door mat is a nice choice for someone just experimenting with home decor. It can be hard to invest in pieces that are purely decorative. Spending a little extra for something that is well made, useful, and long lasting, while also adding a stylish statement is an easier choice. Wright’s distinctive style is evident in the rubber accents on the fiber rug. The rug itself is tough and well-made, and is designed for outdoor use. This accent lamp is the perfect size for a side table. Made with a cherry wood veneer and Lotka paper shade, it is designed with an eye toward Lloyd’s “Tree of Life” windows in the Darwin D. Martin House. The handmade paper shade showcases the attention to detail in this lamp. The Tree of Life Lightbox is a distinctive piece that is sure to grab attention on a side or console table. The lamp has a 5 1/2 foot cord with an inline switch. It is 11 1/2 inches high and 4 1/2 inches deep, as well as 4 1/2 inches wide. A beautiful stand-alone piece, it is important to note that this is an accent light, and not suitable for task lighting. You will need a seven watt candelabra bulb to go with the lamp. Adapted from one of the windows of the Ward W. Willits House, this clock is in a solid wood case with a walnut finish. The battery operated clock is 16 inches tall, 7 inches wide, and 3 1/2 inches deep. This clock features clear front and back panels, with a three color design. Both the case and pendulum are finished in walnut. Another Bulova piece, you can be sure to enjoy this clock for a long time. Wright’s architecture was heavy on detailed molding and trim that isn’t always included in today’s design. Whether you have a mantel or not, you can be sure that this piece will find a home. Its size does make it a somewhat substantial piece, and you will probably feel more comfortable if you can display it out of reach of smaller hands. Stained glass accent pieces are perhaps one of the most distinctive design elements used by Wright. He used stained glass in both interior and exterior works. Although Wright is primarily remembered as an architect, it is these pieces that his interior design experience is showcased. Purchasing a stained glass accent piece is an excellent way to add a little of Wright’s style to your home. This wall hanging is adapted from work of Wright’s that was never used. It is a depiction of flowers and lily pads in a pool of water. The enamel colors are applied to a glass panel, which is then kiln fired. The entire piece is framed in metal. The piece comes with both a hanging chain and wood stand for display. The piece is 15 by 5 1/4 inches. Stained glass is one of the things most commonly called to mind when one thinks of Frank Lloyd Wright. Whether they were windows or accents inside the home, Wright’s interior design training shows through in these unique pieces. Adding your own stained glass element is an easy way to draw on Wright’s inspiration. Stained glass is also a great way to make a space seem larger and more open by reflecting existing light. This wall decoration is adapted from a triptych created for the Avery Coonley Playhouse. The Playhouse was designed as a school, and the design marks the first time Wright broke away from his more traditional geometric shapes to use curved lines. The Playhouse is the site of many bright art glass windows. The Coonley windows, with their bright colors and geometric designs, are some of Wright’s most famous pieces. The wood in this wall element is laser-cut and finished in a cherry veneer. The panels include notching on the back to make installation a breeze. A hanging screw is included with the wall element. It measures 31 1/2 by 11 1/2 inches. This wall element weighs four pounds, making installation a one person job. This piece is officially licensed by the Frank Lloyd Wright Foundation. This wood designed wall element makes a good decorative choice for those who want something different than the traditional stained glass piece that one thinks of with Frank Lloyd Wright designs. It would make a terrific statement piece in an entry or other spot that needs a focal point. The intricate wood design may make cleaning a headache, so keep that in mind when deciding where to hang. 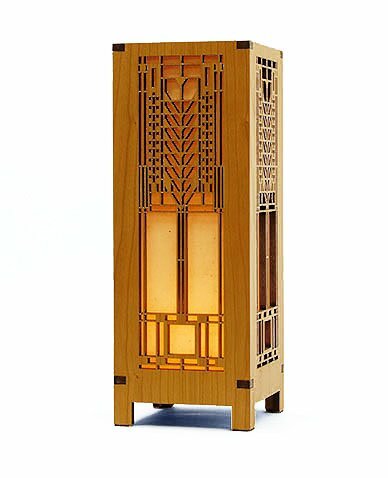 Regardless of your price range, there are many different Frank Lloyd Wright-inspired pieces to add to your home or give as a gift. Attention to detail, pieces that work well with their surrounding, light, and natural wood are all hallmarks of his design. Whether your goal is to add one statement piece, or recreate his look more fully, the above pieces provide a good starting point.